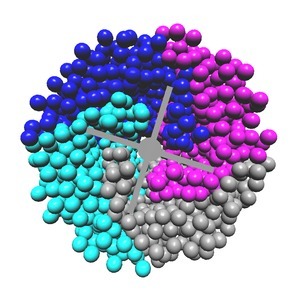 Snapshot of a simulation of a 4-blade vane rheometer with a suspension of hard spheres. The hard spheres are colored by the octant in which it is initially located within the rheometer. Spheres from two of these octants have been ommitted to show the blades of the rheometer. This is the original configuration of a simulation of a mortar. 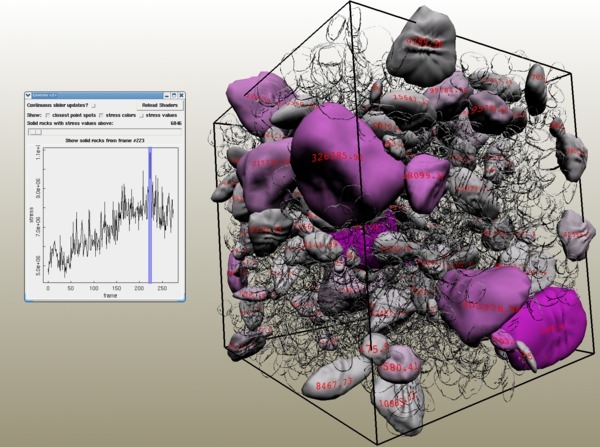 A snapshot of a vane rheometer simulation displayed with a volume visualization of the magnitude of the local stress within the system. The suspended spheres are color coded by the octant they started in. Only 4 of the 8 octants are shown here in order to see details around the vanes. For the added volume visualization, stress is color coded from yellow (low stress), to green (high stress), with stresses below a set threshold not shown. The blades of the rheometer are rotating clockwise. A visualization of a simulation of the flow of concrete with interactive controls. This image won ITLs High Performance Computing and Visualization Group of the Applied and Computational Mathematics Division, one of the 10 Department of Energy Office of Advanced Scientific Computing Research (OASCR) Awards at the 2008 SciDAC Conference, held in Seattle, Washington, from July 13-17, 2008. 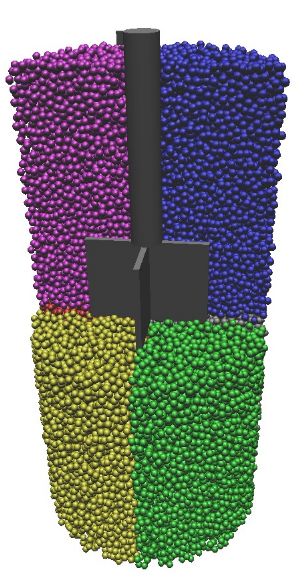 This visualization presented the results of a high-performance computer simulation of the flow of a particular complex suspension: concrete. It showed a flow of a realistic collection of rocks of various sizes whose shapes were obtained by scanning actual rocks. 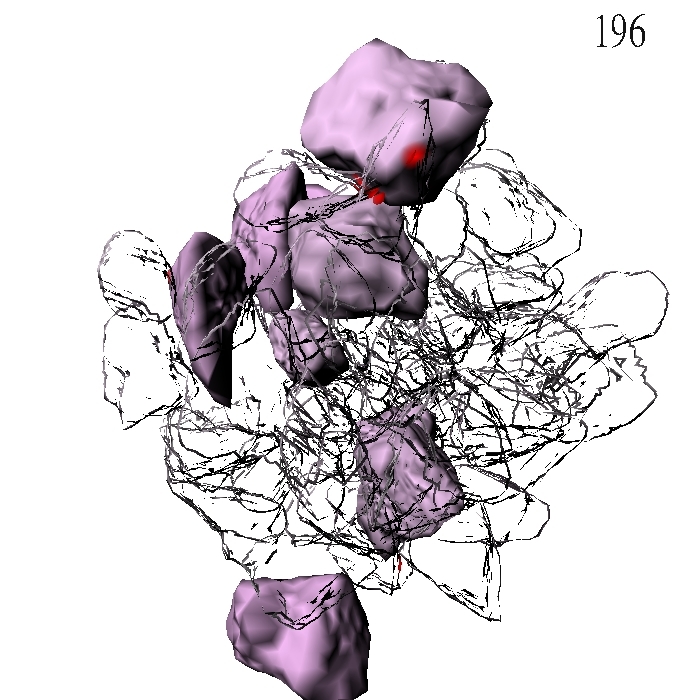 The direct visualization of rocks is augmented with embedded data to provide additional information on rock-rock interactions and per-rock stress. Supported by the Department of Energy Office of Science, the SciDAC (Scientific Discovery through Advanced Computing) program brings together computational scientists, applied mathematicians, and computer scientists from across application domains and from universities and national laboratories across the United States. Simulation depicting start up flow of a hard sphere suspension in a vane rheometer. Movie shows the cross section of a rotating vane's blade. 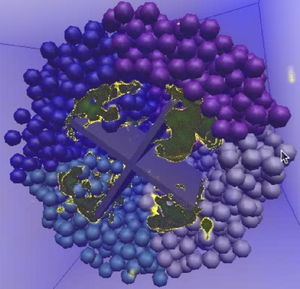 The different color spheres correspond to quadrants the spheres were inititally located in. As the vane rotates the spheres begin to mix. Such simulations can be used to link measurements of torque and angular velocity to fluild properties like viscosity and yield stress. 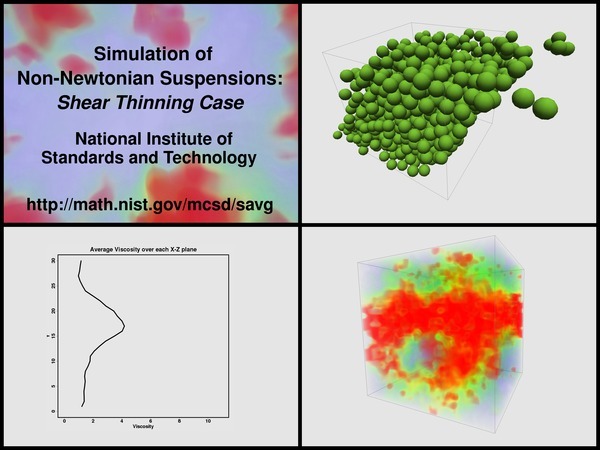 Such simulations can also provide insight into the physical mechanisms that control particle dispersion and mixing. This movie won ITLs High Performance Computing and Visualization Group of the Applied and Computational Mathematics Division, one of the 10 Department of Energy Office of Advanced Scientific Computing Research (OASCR) Awards at the 2009 SciDAC Conference, held in San Diego, CA, from June 14-18, 2009. Quaternion-based Dissipative Particle Dynamics (QDPD) algorithm. As can be seen in the video, the ellipsoids undergo a rotational motion. This is a well known phenomenon called Jeffery's orbits. The period of rotation was derived by Jeffery, and our simulations were found to be consistent with this theory, hence validating our numerical approach. When the solid fraction (ratio of solid volume to total volume of system) of ellipsoids was increased to about 15-20 percent, Jeffery's orbits were suppressed. In this case, the ellipsoids have a tendency to align. An interesting consequence of this alignment is that the viscosity of the suspension is lower than that of an equivalent sphere system (same number and volume of spheres). Note, in the dilute regime (as in the previous movie) an equivalent suspension of spheres has a lower viscosity. One way to think about it is that once the ellipsoids align it is "easier" for them to get around each other. Hence the viscosity decreases. This movie shows a dense suspension of ellipsoids similar in solid fraction to that of the typical aggregate contribution in concrete. Again, at this high solid fraction Jeffery's orbits are suppressed and the alignment between ellipsoids is enhanced. In the flow and placement of concrete, it is important that the fluid concrete have the capability to move around barriers like rebars. In this simulation, we show how spherical aggregates move around stationary cylinders (z-axis is into the screen) which represent steel rebars. We are currently carrying out a study investigating the role of particle shape and size in the flow of concrete around obstructions like rebars. This movie shows the motion of a suspension of spheres in a coaxial geometry. The motion of the spheres is driven by the rotation of the inner cylinder. The outer cylinder is not seen, but can be inferred by the positions of the outer spheres. The viscosity of a suspension is often determined in a coaxial rheometer where an inner cylinder rotates as it is subject to an applied torque. Knowing the torque and the subsequent rotation rate of the inner cylinder, one can derive the viscosity of the fluid in this flow geometry. We are currently investigating how the coupling of the inner cylinder to the fluid suspension affects the measurement of viscosity. Return to The Visualization of High Performance Concrete.